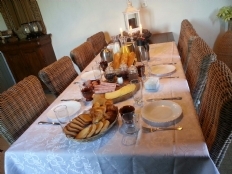 In the 18th century renovated farm you can stay in one of the four guest rooms, consisting of two double rooms and two family rooms. 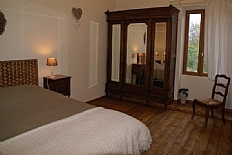 Each room is completely renovated; comfortable, but with the French atmosphere still clearly felt. All rooms have a private bathroom with a shower, toilet and sink. There is also the possibility to make coffee or tea. 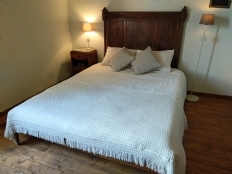 * Chambre Des Platanes is a wonderful double room, furnished with French antiques but with the comfort of today. A comfortable bed of 1.60 m. at 2.00 m. Characteristic are the original high beams. It gives a magnificent view of the old trees and the Lake. To the room is the bathroom with toilet, sink and shower. *Chambre D es Collines is a 4 person room furnished with double bed of 1.60 m. at 2.00 m. and a bunk bed. Also in this room is the beautiful high beamed ceiling a beautiful old detail. To the room is the bathroom with toilet, sink and shower. It gives great views of the pool and the hills. There is a small refrigerator, kettle, crockery and cutlery. If you want to cook you rent and a baking sheet. The room has a private sitting area in the garden with 2 relax chairs and cozy under the tarp a picnic bench. *Chambre L a Petite Porteis a very spacious family room furnished with double bed of 1.60 m. at 2.00 m. and a bunk bed. This room is it possible one or even two beds. The brocante French furniture give a beautiful atmosphere. It leads to the very spacious comfortable bathroom with rain shower, toilet and sink. There is a fridge, kettle, crockery and cutlery. From the room you can enjoy the and campaign of France. If you want to cook you can rent and a baking sheet. The room has a private sitting area in the garden with 2 relax chairs and cozy under the tarp a picnic bench. 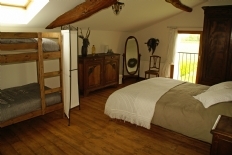 Chambre Du Soleil is a spacious 5 double room. It's on the ground floor where it's always nice and cool. He is furnished with a double bed of 1.60 m. at 2.00 m. a bunk bed and a great box bed. There is a fridge, kettle, crockery and cutlery. In addition to the room is the private bathroom with toilet, sink and bathtub. If you want to cook you can rent and a baking sheet. The room has a private sitting area in the garden with 2 relax chairs and cozy under the tarp a picnic bench. In the common, cosy lounge is a fireplace. In winter time you can take your breakfast, read a book or play a game. In the summer an extensive breakfast is daily served in the Brasserie with and crusty bread rolls and farm-fresh eggs from our own chickens.